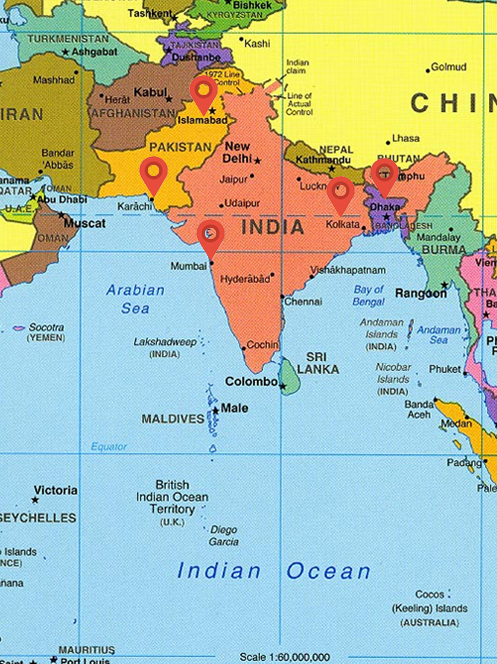 South Asia: Is ‘regime-change’ an end in itself? The alternative for India would and should be to shed the post-Cold War past here and now — re-look at the South Asian priorities. If there is a ‘lesson’ the ‘international community’ (read: West) has to learn (!) from some of the events standing also in their name in South Asia in recent years, it is this: They need to understand that ‘regime-change(s)’ to keep out ‘China-friendly’ governments in individual countries of the region is not an end in itself. If anything, it’s a beginning without an end, where none is equipped to dictate the future course with equal patience and ease, for all time to come. The current events in the Indian Ocean nations of Sri Lanka and Maldives are an indicator of what the West might have planned in ‘good faith’ (?) and what might have gone wrong. It has been true of all US-led western politico-diplomatic expeditions, whether they involved military interventions, or not, in the end. In the more recent, post-Cold War era, Afghanistan and Iraq are standing examples. Vietnam and the Koreas were examples from the Cold War era and Japan in the pre-Cold War end of the Second World War. There were also non-military US engagements with Shah’s Iran and Marcos’ Philippines, where again the results were near-similar, as much for the US as for the local populations. The irony is that not only the ‘target nations’ across the world, but even the ‘perpetrators’ also from the East have not learnt their lessons. It used to be the forgotten Soviet Union during the Cold War. In more recent years, China has sought to achieve with big bucks what politics and military interventions had not achieved for others – but with similar consequences. From a South Asian perspective in general and that of India in particular, Pakistan was/is a stand-alone case, whose consequences are for all world to regret to the present-day. This is also one peculiar case where the US and China have worked separately and together at the same time, the effect of which is the de-stabilisation of the region as a whole. In the post-Cold War era, the perceived Indian bias towards the US may have brought a revivalist Russia also on Pakistani side, if not as much as Islamabad might want – but enough to upset New Delhi, which should be concerned more than in the past. Leave aside the popular upsurge of a new-generation ‘aspirational class’ in Maldives that wanted an end to President Maumoon Abdul Gayoom’s 30 long years of ‘autocracy’ in the last decade. But when a popular government got installed in 2008, it was unadulterated ‘western democracy’ that was ill-suited to the Indian Ocean archipelago. If anything, the people who had lived under an ‘autocratic’ sultanate for a thousand years should have been encouraged to readjust to the realities of ‘modern democracy’. Those who guided the local leaderships under aspiring leader Mohammed ‘Anni’ Nasheed and others did not understand the ground realities, just as those local leaders, whose urgency in replacing autocracy shrouded their one thinking and vision. Leave aside the replacement of Gayoom as President in 2008, subsequent events and developments too have proved that the nation was yet to cope with the realities of western democracy. In a nation where the ‘Male royalty’ centred on the nation’s capital with their peculiarities and prejudices dominating the domestic political discourse all along, the introduction of the ‘commoner’ element has consequences, which are yet to be wholly understood and felt. A closer look at the neighbourhood would have taught a few lessons. If India and Sri Lanka had adapted western democracy at Independence, it owed to the time that the British colonial rulers took – even if unknowingly and unplanned – to instil the concept and install the institutions before leaving their shores. Yet, since Partition, Pakistan has remained a different narrative altogether. It owed as much to the inadequate British understanding of the time as to the subsequent American urgency at re-shaping the post-War world, including these parts. Today, in circa 2018, even as Maldivians have begun deciphering modern democracy, but not wholly grasped all its nuances, neighbouring Sri Lanka (too) is in tatters. Those that engineered the electoral exit of war-time President Mahinda Rajapaksa in 2015 and visualised his replacement with the present-day incumbent Maithripala Sirisena patted their backs for the kind of ‘palace coup’ that they had facilitated at the time. Today, they see their plans lying in waste and their ‘palace coup’ leading them nowhere. The West had not looked through the possibility of Sirisena returning the compliment now, by replacing their favourite UNP Prime Minister Ranil Wickremesinghe with his predecessor and friend-turned-foe Rajapaksa. The events of the present-day were very much written into the script even at inception, and no one needed to have waited for the twin inauguration of Sirisena and Wickremesinghe. The latter was as much unconstitutional at that time as Rajapaksa’s now is, after the 19th Amendment to the Constitution. The fact remains that both in Maldives and Sri Lanka, not to leave out nations like Pakistan and Afghanistan in India’s northern neighbourhood, the international community had gone home to other ‘trouble spots’ once they saw a ‘friendly government’ in place in one South Asian country or the other. They had little time and no energy left for the region, until summoned as they were – not soon after they thought it was all in the past. In doing what they did at ‘regime-change’, the West also tightened the screw on ‘unfriendly regimes’ in the region when they wanted, and eased the pressure when they needed. It was thus that ‘war crimes’ and ‘accountability issues’ became a convenient tool to try and ‘fix’ President Rajapaksa when he was seen as tilting too much towards China, going beyond the demands of developmental spending in his country, which only Beijing was ready to do. Once the domestic scene in Sri Lanka changed, the West could not but sing a different tune at the UNHRC on ‘war crimes’ probe and the like. Now that they seem to be getting an ‘unfriendly government’ in Colombo all over again, they may well have a quick re-look at Geneva, which anyway, is due as per Sri Lanka’s co-sponsored resolutions of 2015. If anything, that is what the Sirisena-Rajapaksa duo would desire in electoral terms, whether or not they are able to win a parliamentary majority, when the House reconvenes on – or, before/after — 14 November. Where does it all leave India with? Post-Cold War, South Asia is no more considered the ‘traditional sphere of influence’ for India. Whether or not other nations of the world consider it thus, New Delhi has since given up such claims, and the beliefs on which such construct rested. India has also stopped thinking and behaving as such. This was India’s geo-political strength in and for the region than the geo-strategic strength, where ‘external powers’ still could have made a difference, and did do so, even earlier. In the present-day context, China is as much an ‘extra-regional player’ in the region politico-economically as the US has been for long, politico-militarily. Like with US in and on Shah’s Iran and Marcos’ Philippines and also Zia-Musharraf’s Pakistan, China too seems to be learning a few lessons in nations such as Sri Lanka and Maldives. At least in Sri Lanka, Beijing, however, seemed to have made a calculated ‘political profit’ when the Wickremesinghe regime signed the ‘debt-to-equity’ deal on Hambantota, against possible Indian expectations. With the new leadership yet to take over after the 23 September presidential polls, it remains to be seen how ‘new’ Maldives handles China, and more so, the huge Chinese debt. Should China really ‘fail’ in its ‘debt diplomacy’, for which the chances are as bright as was the case for the US in these parts in the Cold War era and even later, India may be left to handle the mess that they all leave behind. It is better thus for New Delhi to be safe and pro-active now than be sorry later. ‘Pro-active’ not in ways that the West wants, but in re-asserting its role as the ‘responsible’ leader of South Asia, whose limitations in terms of sovereignty too needs to be acknowledged by friends first, before targeting the adversary in political terms. What is thus required is a better understanding of India’s role in and responsibilities to the region, starting with itself. As the events and developments in Maldives and Sri Lanka have shown, slowly but surely, South Asia is becoming the theatre for a neo-Cold War. At the end of it, India may end up becoming an unwilling player in the game, just as the rest of the regional nations. Worse still, after a time, India and other South Asian nations (including or excluding Pakistan) may either be in the depth of distress from which they may not be able to find an escape-route. The alternative for India would and should be to shed the post-Cold War past here and now, re-look at the South Asian priorities and New Delhi’s role and responsibilities, and re-design its geo-strategic and geo-political priorities in such a way that there is social, political and economic stability as much in the region as in individual nations, starting with India.